In the male-dominated field of computer science, Dee Weikle is used to being in the minority. The associate professor of computer science at EMU can name all of her female students majoring in the field on the fingers of one hand. One of those students, among the approximately 18 percent of women who will earn a computer and information science degree in the United States, is Jennifer Fawley, in the process of earning her second bachelor’s from EMU (her first is in environmental sustainability). Weikle and Fawley together attended the October 2014 Grace Hopper Celebration of Women in Computing in Phoenix, Arizona, which attracted 7,500 women in STEM-related professions, particularly computer science. At the convention, Fawley chose from a variety of sessions, workshops, and networking opportunities, from her particular interest of cybersecurity to data science, programming languages, cloud computing, wearable computing, hacking for social justice, and plenary sessions with technology executives from companies such as Google, Microsoft, Symantec, and Mozilla. Weikle earned a PhD in computer science at the University of Virginia. She began her career journey with a bachelor’s of science in electrical engineering from Rice University. She subsequently worked as an engineer at Tracor Aerospace and then Motorola Semiconductor in Austin, Texas. 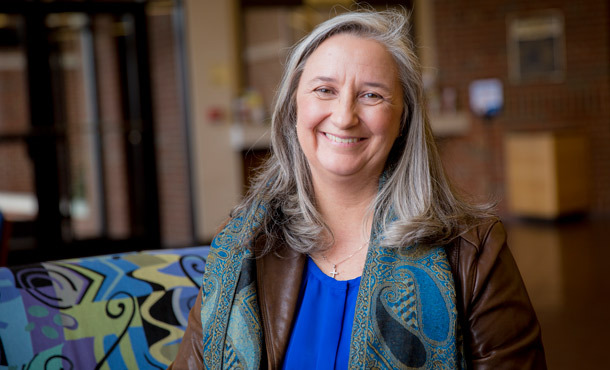 In a mid-career shift, she focused at UVa on computer architecture with an emphasis on memory system analysis and design. At EMU, she teaches a wide range of subjects, including Introduction to Computer Science, Computer Architecture and Operating Systems, and Analysis of Algorithms. She is currently involved in computer architecture research attempting to characterize parallel programs. In addition, she has conducted research on workload characterization for parallel programs, educational initiatives in computer science, and the effect of computing technology on society. This article appeared in the fall-winter 2014-15 issue of Crossroads, EMU’s alumni magazine.